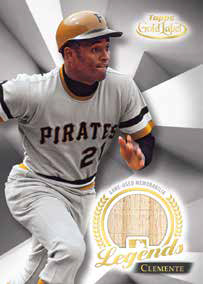 This is the 20th Anniversary of the Topps Gold Label product line. 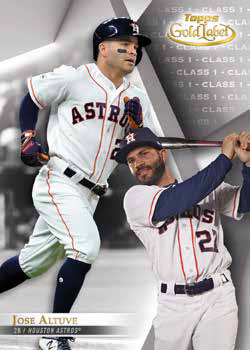 Sticking to its roots, 2018 Topps Gold Label Baseball comes to its devoted collectors in tiers, which has three different versions of every card. Each seven-pack hobby box are not necessarily driven by hits. That said, each 2018 Topps Gold Label Baseball box does come with one framed autograph which also comes in numbered parallels. 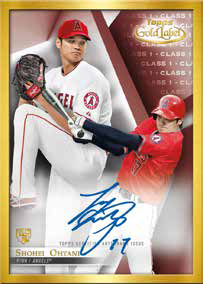 2018 Topps Gold Label Baseball ($59.95 per box) arrives Friday, October 12th at Sports Cards Plus. 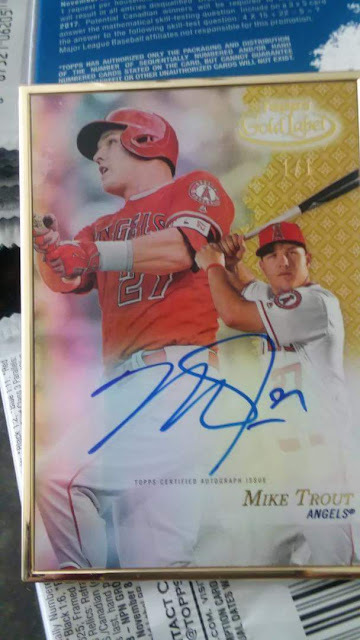 Last year Tom pulled this Mike Trout Gold Framed 1/1 Autograph. We are expecting more Super Hit Factory Topps Gold Label magic in 2018. This third year for the resurrected line that had its original run from 1998 to 2002. From its earliest days, one of the big draws came with the use of multiple levels of base cards. Similar to Flair Showcase sets from the same era, the first tier, Class 1, are the most common. As you work through Class 2 and Class 3, things get progressively tougher. These aren’t really parallels as they come with different images. Because Class 1 cards are the easiest to pull, they’re considered to be the base set. Rookie Cards on the checklist include Ronald Acuna Jr., Gleyber Torres, Shohei Ohtani and Rhys Hoskins. Juan Soto is not in the base set, although he does have a Framed Autograph. Topps Gold Label Parallels have always been hugely popular with collectors, landing about four per hobby box. Black are the only ones that aren’t numbered. Class 1 Black cards are one every other pack. Class 2 and 1:6 and 1:20 packs for Class 3. Other parallels include Blue (Class 1 – /150, Class 2 – /99, Class 3 – /50), Red (Class 1 – /75, Class 2 – /50, Class 3 – /25), and Gold (1/1). Given the structure of the base set, the only other insert-type cards come in the form of autographs and a small number of memorabilia cards. Framed Autographs are the cornerstone of the hits. This approach is usually reserved for case hits and other rare cards in other products that use them. Besides base versions, Framed Autographs have Black (/75 or less), Blue (/50 or less), Red (/25 or less) and Gold (1/1) parallels. 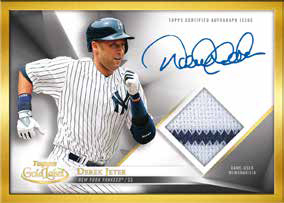 New to 2018 Topps Gold Label Baseball are Golden Greats Framed Autograph Relics. Regular copies have a maximum of 50 copies each with parallels limited to Black (/5) and Gold (1/1). 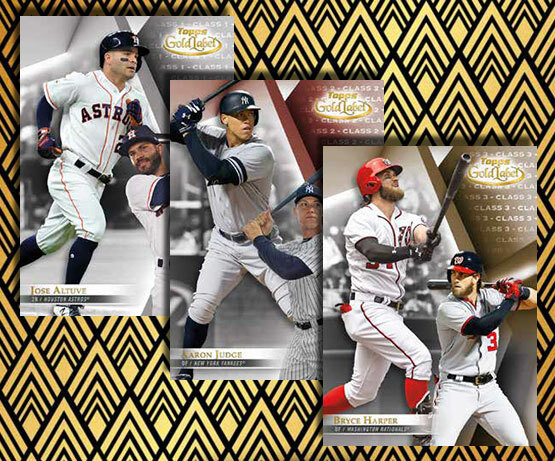 All-time greats are the focus of MLB Legends Relics, which are the only unsigned memorabilia cards in 2018 Topps Gold Label. 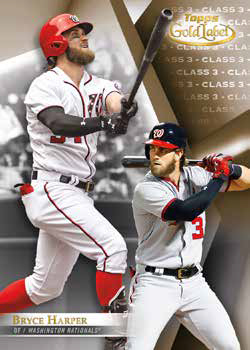 Base versions have 75 copies or less with Black (/5) and Gold (1/1) parallels. 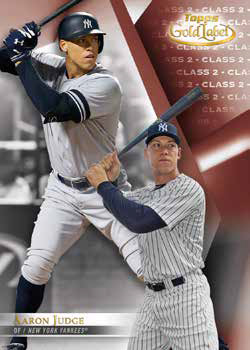 2018 Topps Gold Label Baseball is a hobby-exclusive product.